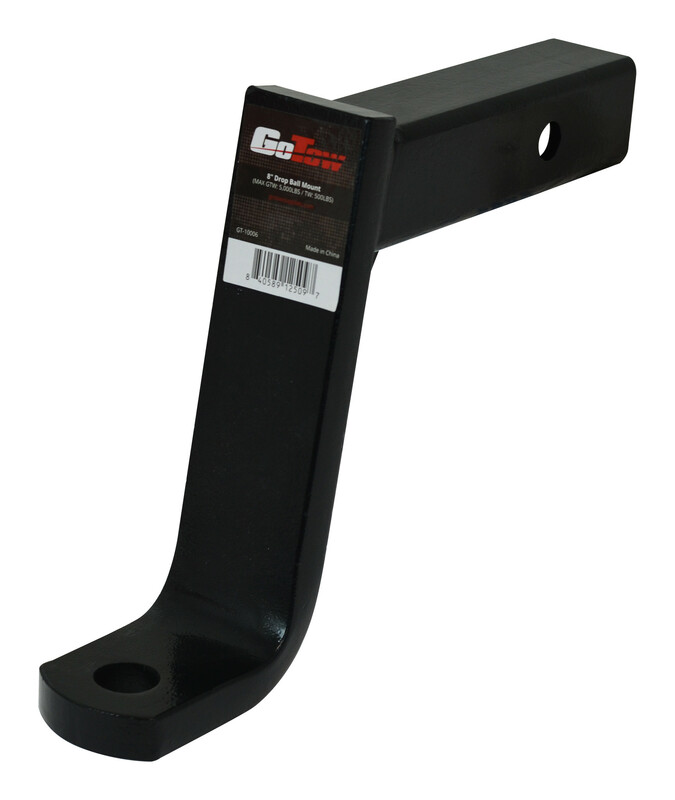 The GoTow 8" Drop / 6" Rise Mount will up your towing game if you have a 2" receiver on your vehicle. This ball mount is the perfect solution to get that perfectly level trailer. Ball mount is weighted to haul a max gross trailer weight (GTW) of 5000lbs and a max trailer tongue weight (TW) of 500lbs. The GoTow 8" Drop / 6" Rise Mount will up your towing game if you have a 2" receiver on your vehicle. This ball mount is the perfect solution to get that perfectly level trailer. Ball mount is weighted to haul a max gross trailer weight (GTW) of 5000lbs and a max trailer tongue weight (TW) of 500lbs. Expertly crafted this hitch is sure to hold up for years and years of towing excellence. Length from center of the pin hole to the center of the ball is 8.5". Pin hole is 0.66" in diameter. Ball hole is 1.00" in diameter. Pin and clip for the receiver are not included. Ball hitch is not included.